NASA's Juno spacecraft captured this enhanced-color view of Jupiter during its fourth close flyby on Feb. 2, 2017. NASA's Juno spacecraft whizzed closely by Jupiter today (March 27) in its fifth flyby of the gas giant. Juno made its closest approach at 4:52 a.m. EDT (0852 GMT), skimming 2,700 miles (4,400 kilometers) above Jupiter's cloud tops while traveling about 129,000 mph (208,000 km/h) relative to the planet, NASA officials said. "This will be our fourth science pass — the fifth close flyby of Jupiter of the mission — and we are excited to see what new discoveries Juno will reveal," Scott Bolton, principal investigator of Juno from the Southwest Research Institute in San Antonio, Texas, said in a statement Friday (March 24). "Every time we get near Jupiter's cloud tops, we learn new insights that help us understand this amazing giant planet." Juno arrived in orbit around Jupiter on July 4, 2016, after a nearly five-year journey through deep space. Since then, the probe has made several new discoveries about the planet's composition and cloud structure as well as its magnificent auroras and magnetic fields. Because the spacecraft is in a highly elliptical orbit around Jupiter, these close encounters occur only once every 53 days. NASA planned to bring Juno into a closer orbit around Jupiter with a maneuver that would have brought the time it takes to circle the planet to 14 days, but a problem with two helium valves forced the space agency to scrap those plans in February. "During these flybys, Juno is probing beneath the obscuring cloud cover of Jupiter and studying its auroras to learn more about the planet's origins, structure, atmosphere and magnetosphere," NASA officials said in the statement. 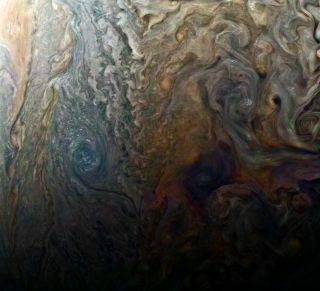 The Juno team is still working to analyze data from this and the last four flybys and expect to publish new research papers with science results within the next four months, they added. The Juno mission will end in February 2018, when the spacecraft is scheduled to plunge into Jupiter, intentionally crash-landing after 20 months in orbit.